Not worth a whole review though, so then I started searching around to try and find another app. Thats when I came across this free pocket wine guide which I thought was kind of neat. 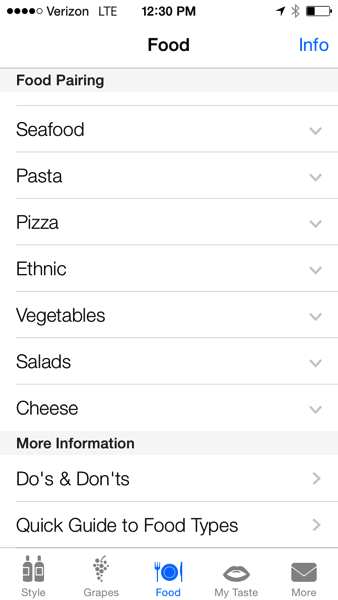 You can search by style, grapes, or food pairings. I spent an entire summer in Europe (Barcelona, Spain) and learned tons about wine, but I can’t remember any of it. These days I just know I prefer red to white and that is about as far as my knowledge will take me. I think the food guide is the most helpful. You can pick what type of food your interested in pairing the wine with and it gives you the best options. Pretty neat huh? Food Holiday & Foodie TV —-> Fun Apps for Bloggers and Foodies! Speaking of wine…. if we were having a glass of wine together there would be 5 things I would tell you I would be excited to tell you. Just in case you needed a reason to eat any of those foods! Country Thunder is a four day concert in the middle of no where desert Arizona. I’ve wanted to go every single year since I was I don’t know 12? However after Spring Break every year I always seem to be too broke, funny how that works. This year I sent a text to one of my besties at 8AM by 10AM her plane ticket was booked and our tickets were printed I CANT WAIT! We are only going for one day but I don’t care, its going to be amazing, not only that but she will be the first guest in our home… that reminds me we need to get a bed for her! Last year at Easter I received my Baptism and first Holy Communion in the Catholic Church, so this year is a celebration of Jesus’ triumph over the cross and of a full year of me being catholic. I still have a little nagging soreness in my lower back from when I strained it back in January but its definitely more manageable. I’m starting to strengthen a little more every day, baby steps that I’m super grateful for! What are you excited for in April? Any special plans for Easter?